Tonight, my friend and sous-chef, A and I hosted a mutual friend, M, for dinner. As we were preparing for dinner, we opened the fridge and I realized I only had goat cheese, milk, and pasta, while A only had some leftovers stolen from our college dining hall. Luckily, M came through for us and brought 3 beautiful tomatoes and an eggplant. I immediately thought of shakshuka, a Mediterranean dish that looked hearty and best of all, easy. While the onions were happily sizzling in the pan, I quickly glanced over the recipe and somehow misread “diced tomatoes” as “pureed tomatoes”. Then for kicks, I threw in some slices of eggplant. That’s when things started getting a little bit crazy. The eggplants, being eggplants, released a ton of water into the pan, and suddenly, it looked like we’d be having tomato soup for dinner. Undeterred, I turned up the heat and tried to make the best of the soup by using it to poach three eggs. While our strange concoction brewed away, M told us about her study abroad experience in South Africa. While she was there, she shaved off all her hair for a charity that makes wigs for children with cancer. It started as a joke, but after thinking about it for a weekend, M went ahead and did it. She told us that apparently, when you shave your head, you can suddenly feel everything – the wind actually brushes against your follicles, transforming sitting in front of a fan into a magical experience. We also talked about what truly makes a study abroad experience exceptional: the people you meet, especially the locals. M spoke of the three weeks she’d spent her “mama” and host family as life-changing because she was able to live, rather than simply experience the culture of South Africa. 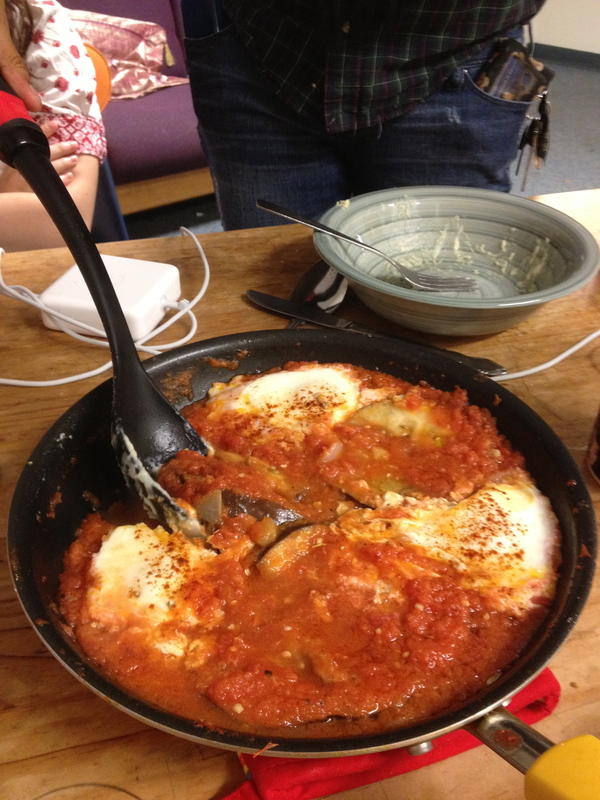 Now I’m sure you’re dying to know what the hell happened to our poor shakshuka. After about 20 minutes, most of the liquid had boiled away and the eggplant had become soft (yay!). I sprinkled in a little more salt, pepper, and paprika to taste, then served it, still in the pan. And you know what? It actually tasted good! I was honestly a little shocked that after all the deviations from the recipe and some “creative” measures, we had a dish that did taste Mediterranean and hearty. I guess it’s a little like studying abroad – every experience is different and somewhat unexpected, but we make it work, and in the end, it can become something amazing. Break down the tomates with the help of a potato masher. Crack the eggs directly over the tomato sauce, make sure they’re spaced out evenly over the sauce. Cover the pan and cook for another 8-10 minutes or depending on how soft or well-done you like your eggs. Garnish it with chopped parsley, a drizzle of extra virgin olive oil, and black pepper.